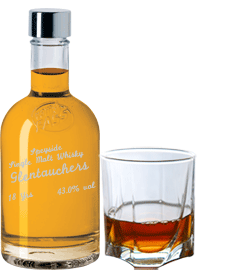 Home › Whiskies › Speyside Single Malt Whisky "Glentauchers" 18 years 43 % alc. Speyside Single Malt Whisky "Glentauchers" 18 years 43 % alc. Yellow golden color. Intense, multi-layered aroma with notes of honey, the finest malt, vanilla and that certain "Speyside-something", just wonderful. On the palate of dense and very harmonic style, noble wood notes, vanilla, malt, fruit (apricot) and great elegance. Long and with a pleasant pungency in the finish. Matured in "First Fill Bourbon Barrels".